Lineage. Constituted as 10th Air Rescue Squadron, and activated on 1 Apr 1946. Redesignated 10th Air Rescue Group on 14 Nov 1952. Inactivated on 8 Jan 1958. 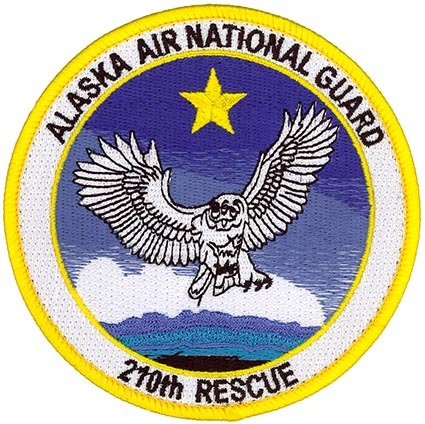 Redesignated 210th Air Rescue Squadron, allocated to Alaska ANG and received federal recognition on 4 Apr 1990. Activated on 11 Aug 1990. 210th Rescue Squadron on 16 Mar 1992-. Assignments. Alaskan Air Command, 1 Apr 1946; 10th Air Division, 1 Nov 1950-8 Jan 1958. 176th Composite Group, 11 Aug 1990; 176th Group, 1 Jan 1993; 176th Operations Group, 1 Oct 1995-. Components. 71st Air Rescue Squadron, 14 Nov 1952-8 Jan 1958. 72nd Air Rescue Squadron, 14 Nov 1952-30 Sep 1953; 73d Air Rescue Squadron, 14 Nov 1952-30 Nov 1953; 74th Air Rescue Squadron, 14 Nov 1952-8 Jan 1958. Stations. Elmendorf AFB, AK, 1 Apr 1946-8 Jan 1958; Kulis ANGB, AK, 11 Aug 1990; Joint Base Elmendorf-Richardson, AK, 18 Feb 2011-. Aircraft. SA-16, 1952-1958; H-5, 1954-1955; C-54, 1954-1955; SH-19, 1954-1956; SC-54, 1955-1958. SH-21, 1956-1958. HC-130, 1990-2004; HH-60G, 1990-. Operations. Man, equip and train a combat-ready unit to provide and sustain combat search and rescue (CSAR) operations in the Pacific Theater. Support in-place and deployed contingency operations for Rescue Coordination Center (RCC) directed, all-weather, long range missions. Provide 24-hour rescue alert for mainland Alaska at Kulis ANGB, and operate as a geologically separate detachment, providing rescue alert and range support at Eielson AFB.